After remaining silent about Ukraine for over two weeks, on May 7, the Russian president came out with a sensational statement. Many opponents of Russia are already regarding this as his surrender of the southeast of Ukraine; however in reality, this is just one more step towards the realization of Russian interests in Ukraine. The goal is to minimize potential damage. After meeting in Moscow with the OSCE Chairman, President of Switzerland Didier Burkhalter, Russian President Vladimir Putin made a series of unexpected comments concerning Ukraine. In particular, he asked residents of the southeast of the country not to hold a referendum, expressed his support for presidential elections in Ukraine on May 25, and announced the withdrawal of Russian troops. Several opponents of the president interpreted this speech as evidence of the surrender of the southeast of Ukraine, as well as the weakness of Vladimir Putin and the entire Russian regime, which fears additional sanctions. However, in reality, in speaking this way, the president had two objectives. First of all, he showed the world Moscow’s willingness to honor the commitments it made in Geneva to de-escalate the situation in Ukraine. This greatly reduces the risk of having an economic package of sanctions being imposed against Russia – at least because, after Putin’s speech, the United States will have an even harder time trying to convince European politicians of the need for such a step. The market reacted very positively to the statements made by the Russian president – the euro fell below 49 rubles, the dollar – below 35, and the indices on the stock exchanges increased by 5 percent. In addition, by taking this step, Putin is actually pushing the Ukrainian authorities to become more active. Until now, the strategy of Kiev was very simple – escalation of the situation, confrontation with Russia and constant complaints to Washington and Brussels. Now the Russian president has set Kiev a more complicated task – the need to respond to the proposals put forward by Moscow. And now, if Putin’s plan succeeds, the answering moves by the Kiev authorities will either bury them completely or lead to a de-escalation of the situation and the federalization of Ukraine. Both of these options will satisfy Russia. Let us look at the main points of the Russian president's speech. Putin spoke out against the holding of referendums on regional autonomy in the Donetsk and Lugansk regions of Ukraine on May 11. This statement, however, should not be regarded as a refusal to provide protection to people in the Donbass. He thus presented the Ukrainian authorities with an extremely unpleasant dilemma. As we already know, on May 6, the Verkhovna Rada voted against holding a referendum on decentralization. And now Ukrainian parliamentarians will either have to change their minds and overcome their own anti-Russian phobias, or publicly take responsibility for the failure of the peaceful approach to solving the problems proposed by the Russian president. After all, Putin’s demands are actually supported by a number of international actors, including UN Secretary General Ban Ki-moon and the head of the OSCE. Moreover, no matter which of these options the Verkhovna Rada takes, it plays in favor of Russia. Secondly, the obligation to take action in response to Putin’s statement, falls only on the Kiev authorities – the federalists are not obliged to listen to the Russian president. 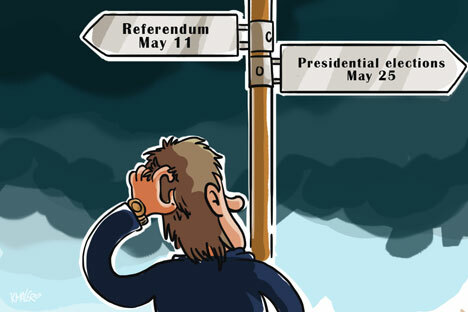 If the Donetsk authorities do decide to go ahead with a referendum, then blaming Putin will not be easy. Representatives of the federalists have correctly interpreted the Russian president’s speech, and have already presented the Kiev authorities with the conditions under which they may abandon their planned referendum. “These include an immediate cessation of anti-terrorist operations and withdrawal of all units of the armed forces and the Interior Ministry to their places of permanent deployment; the disbanding and disarming of all illegal armed groups, the release of all political prisoners, including those detained on trumped-up criminal charges,” said Oleg Tsarev, member of the Verkhovna Rada. Putin’s statement concerning the Ukrainian presidential elections can be viewed in a similar vein. Having stated that, “the presidential election – in itself is moving in the right direction,” Putin demonstrated to the West, and Kiev, that Moscow is not going to disrupt, and perhaps is even ready to recognize its results. Some political analysts regard this statement as a demand to adopt a new constitution before the holding of the elections. Moreover, they do not rule out the possibility that Moscow has already agreed with the West that the elections in Ukraine will be postponed. Finally, Putin said that Russia is no longer concentrating its troops near the border with Ukraine. Moscow has never intended to formally send its army into Ukraine – as this would be followed by the imposition of extremely harsh sanctions and political consequences, not to mention the undesirability of having to wage a war. Sending in troops is rather seen as the last resort, a tool to achieve the real goal – to keep the southeast of the country under the control of the federalists. And now, it seems, new tools have come into play to achieve this goal – reports are coming in from the Donbass about the arrival there of groups of Russian “volunteers” with weapons. Thus, keeping troops on the Ukrainian border is becoming politically and even economically unprofitable. The Ukrainian authorities seem to understand Putin’s game plan, and are trying to neutralize his latest moves. “Dear Vladmir Vladimirovich, trying to sell us air is somehow unbefitting of the president of a large country,” said Acting Prime Minister Arseniy Yatsenyuk. “In answer to the statement that Russia is asking to have the May 11 referendum postponed, we would like to inform the Russian president that no referendum was ever planned in Ukraine for May 11.” However, if Putin’s statement really was agreed with Europe, then very few people will be interested in the opinion of Kiev. First published in Russian at Expert magazine.